I grew up on a farm in southwestern North Dakota and attended college in Fargo, ND. There I met my husband and we moved together to the Houston, TX area where we lived the first seven years we were married. We returned up north to Minnesota over 10 years ago when our oldest son was born. We have 10 and 6 year old sons, and I am a stay at home mom, though I have learned as they get older, there isn't much stay at home in my job as a mom... I spend a lot of time volunteering at school, chaperoning field trips and getting them where they need to be. Before I stayed home, I was a principle for an independent financial planning firm in Texas. 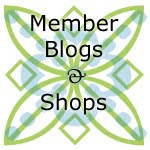 I have a blog, Badlands Quilts. I have a small etsy shop that I sell extra items from my stash that I might not need/like and also OOP fabrics that I come across on my small town travels. I enjoy gardening and decorating in addition to quilting. Life has gotten busy enough though, I am happy my yard is at a maintenance stage so I can devote my little free time to sewing. For our first house, I did a lot of home dec sewing: lined drapes, bed skirts, duvets, slipcovers, etc. I first became interested in quilting when my mom made a quilt for my oldest son almost 11 years ago. I have been quilting more intensely since 2009 when I started my blog, though there have been times since when I haven't sewed much due to family activities and home improvement projects. I grew up in a house with 2 older sisters and a mom that all sewed so I probably started on sewing on a childs machine when I was 4 and have been a fabric addict since! Good question, not enough! When I first started quilting I participated in a lot of doll quilt type swaps, and I've cut back so I can make a few quilts for my own house! Actually Flaun and I were discussing this and I have over 20 UFOs?! I used a set of fat quarters that I didn't like very much (thinking I would make mistakes) and modified a design out of a Fons & Porter Simple Quilts magazine. It is a triangular log cabin piece made using Kaffe Fassett prints in reds, pinks and oranges for a placemat swap on flickr. I just love the collision of color and hope to make a larger one to keep for myself sometime! I sew in my basement guest room. While I at times I dream of a dedicated space I am fortunate for what I have. Like many, when I first started quilting I bought more than I do now and often bought FQs from the same fabric groupings. Lately, I am attracted to neutral backgrounds, text fabrics or will buy FQ/ half yards to add to my color drawers. My favorite part is cutting and I don't really have a least favorite part, sometimes with very intricate piecing I just want to be done by the time I finish with just that. Try to work out a more consistent schedule to include sewing during the day. For many years, I've stayed up late and done most of my sewing after my boys go to bed but they go to school early enough that morning comes too quickly! I have done very little appliqué. I'd like to learn a bit more so that if I were to find an appealing project I wouldn't avoid it. And I'd like to continue to improve my free motion quilting skills. Blogs and decorating magazines. I have always loved Kaffe Fassetts work and also Gwen Marstons. Just jump in and give it a try. Most people learn best with hands on experimentation. As you get going you will learn what quilt rules are good to stick with (washing with color catchers) and other rules that you really don't need to follow. Just thanks for reading if you made it this far! Love this last quilt on your member spotlight, what great colors!